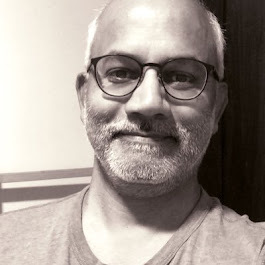 I know I have reached a stage in life where kids and college students might only see me as a balding grey older man. When we don't know a person from the time they were young, then we are perhaps left with nothing but an image of them being their older selves. As if they were born old. Our skin dries up and wrinkles all over. We return the teeth to the cosmos. The eyes that were once bright and mischievous become dull and lifeless. The ears hear not the faint sounds as if there is no more sweet whispers in life. The fancy colognes of the youth make no difference to the nose that does not pick up any scent, including our own odor. When we are young and energetic, we do not pause to think that we, too, would one day begin to look like those at the old-age homes. And, worse, we fail to understand deep within ourselves that after the appointed hour, we will cease to exist even as the wrinkled, toothless, bald, grey, shuffling, smelly versions. Near my home--yes, the only home I have, which is in Eugene--is a complex that houses quite a few super-senior citizens. When I see them shuffling along on the bike path, or in their motorized transport, all I see are the old people. It is not easy to visualize them as crazy kids diving into the river, or as young men and women in love. We forget that they also went through childhood, adolescence, and youth, and everything else like the rest of us mortals. When visiting with the folks over the winter break, I helped my parents get rid of a few things and re-organize a few others. "You told me not to throw out the photo negatives," my father reminded me. "So, I retained them. You decide." They were mostly garbage. Every once in a while, a negative seemed promising. The garbage piled up as I emptied the contents. And then I saw a couple of negatives. I, too, was a kid once. I followed up on M's suggestion. "I would like to get prints from these negatives, and also get them scanned," I told the older woman at the shop. She, too, was young once. But, all I saw now was an older woman. She held them up against the light. "It is me from my younger days, back in India." She smiled, as if agreeing with me that we were young once, even though we look old now. 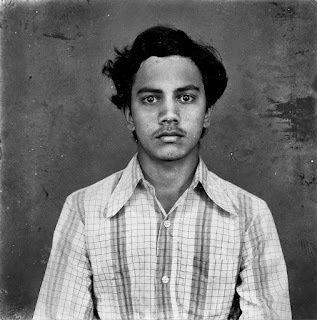 A "pappu face" me in 1980! I suppose this might have been a photo taken in Kembu studio. Who owned a camera then !! Yup. Time and tide wait for no man. Was that the name of the studio? I see that studio in my mind. It was in Main Bazaar. A few storefronts down from Laxmi Bakery. "I know I have reached a stage in life where kids and college students might only see me as a balding grey older man." Every single time I see you (I am totally serious) I am thinking in my head: "He has no wrinkles, how the hell does he do that?" Since I too look 10 years younger than my age, I tend to notice these things in others.